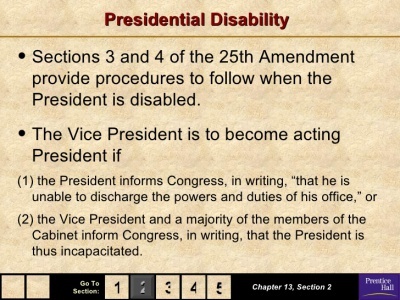 While the more well-known constitutional amendments, like the First and Fourth amendments, get all the attention, the 25th Amendment is significant because it describes what happens if the president dies, resigns, or becomes disabled while in office. Who's next in line for president? 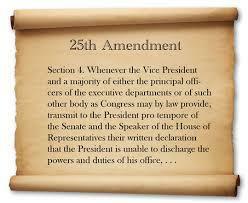 The main purpose of the 25th Amendment is to describe what will happen if the current commander in chief is unable to fulfill his or her duties. The first section of the amendment states that if the president dies while in office, resigns, or is removed by Congress, then the vice president will take over. 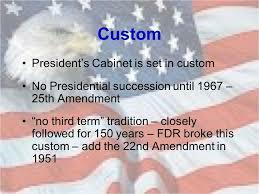 Though not specified in the 25th Amendment, next in the line of succession under federal law are the Speaker of the House, the President pro tempore of the Senate, and then presidential cabinet secretaries beginning with the Secretary of State. Who'll replace the vice president? Along with providing direction for who'll replace the president, the 25th Amendment also tells us how a vice-presidential vacancy will be filled. If the vice president vacates his position during his term, the president will nominate a replacement. Congress must then confirm the nominee before he or she can take office. What is a president's written declaration? If the president feels like he or she is unable to perform the duties of the office, the president can submit a written declaration to Congress, and the vice president will take over as commander in chief. This clause of the 25th Amendment was used by President Richard Nixon when he resigned from office, and Vice President Gerald Ford took over, the Ford Library Museum explains. 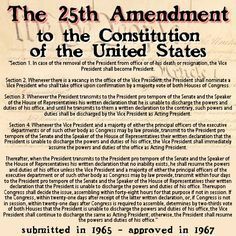 What section of the 25th Amendment has never been used? If you're a fan of "The West Wing," you may remember the episode exploring the issues of the fourth clause of the 25th Amendment. The last clause of the amendment gives the vice president and Congress the ability to remove the president if the commander in chief is unable to fulfill his duties. The president can only be removed if both the House and the Senate approve the request by a two-thirds vote. As powerful as this clause is, it's never been used. Which states haven't ratified the 25th Amendment? For an amendment to become part of the U.S. Constitution, at least, three-fourths of all states (38 states), need to ratify it. 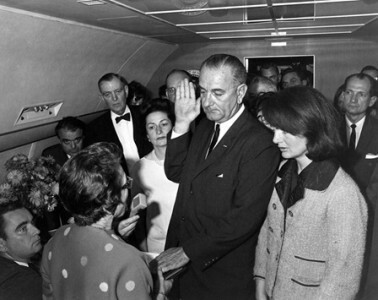 That happened on February 10, 1967. Eventually, a total of 47 states ratified the amendment. 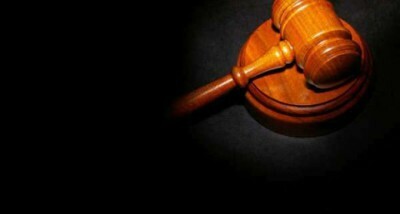 Still, three states -- North Dakota, Georgia, and South Carolina -- did not ratify the 25th Amendment.